﻿Click here to download the complete Albion Wheels PDF. Premium cast iron, sometimes referred to as semi-steel, offers the highest tensile strength in the industry (30,000 psi). A cost-effective solution for high capacity applications. Various bore sizes available for use as plain bore wheels or to be used with keyway and set screw or with a variety of bearings. Cast iron offers 30,000 psi tensile strength. Available in Single- and Double-Flange. 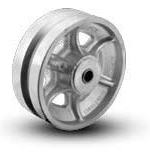 Wheel face and “V”-groove are machined from heavy duty cast iron. A relief groove at the base of the “V” tends to equalize the load to each face of the angle track when in operation. Wheel face and bore are machined for concentricity to proper tracking. These wheels can be used not only on track but flat surfaces as well. VL wheels feature a larger bore for greater capacity. 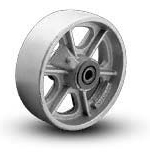 Ductile Wheels feature higher capacities compared to cast iron wheels. Wheels are painted black. Full radius tread design makes them easier to swivel and roll. Wheel are painted black. Hi-Temp Nylon: Can withstand intermittent temperatures up to 550 degrees Fahrenheit. 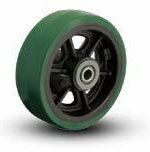 Nylon Glass-filled wheels won’t chip, absorb water, or breakdown in caustic environments. Glass-Filled Nylon: Maximum performance. Innovative nylon and fiberglass construction stands up to solvents, extreme temperatures and high load capacities. Won’t absorb moisture! These unique high impact polymer wheels deliver superior rollability, capacity and slide resistance. Trionix™ features unique polymers that resist corrosion and most chemicals. Injection molded process (NY). Non-injection molded process (NX). Wheels are molded of heavy macerated or chopped cotton denim, impregnated with phenolic resin and formed in close fitting molds under high pressure and temperature. They are non-marking and excellent load carriers. A new innovative wheel featuring heavy-duty reinforced fiberglass filled polypropylene. Our test data shows that it last three times longer than the competition. 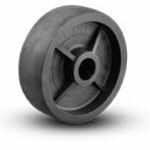 Wheel has excellent mobility under heavy load and resists many features excellent chemical resistance. Composed of a polyurethane elastomer, open cast or injection molded, on clean, close tolerance cores. Polyurethane tread is chemically bonded to a cast iron or aluminum cores. High capacity polyurethane protects floors, is non-marking and delivers quieter operation than standard metal wheels. Designed specifically for high capacity manual applications involving chemicals, solvents or water. X-tremely low rolling resistance provides the ergonomic qualities you demand. One-piece construction affords freedom from tread separation with an exceptionally long life. Non-marking, floor protective tread. OG: Polyurethane tires reduce operating cost because the high wear resistance of this material minimizes replacement. Polyurethane offers easier rollability, higher wear resistance, and greater capacity than rubber. XA: Excellent properties where washdown of material handling equipment is required. Tread is mechanically locked to an injection molded polymer core to prevent separation. 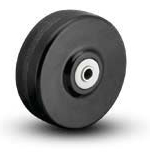 Polyurethane wheels offer greater load capacity than rubber. They offer excellent floor protection. Heavy Duty cushion rubber treads are vulcanized to cast iron cores. The harder rubber tread still provides a cushion effect to the load and excellent floor protection. 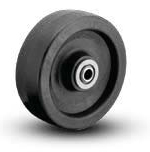 These wheels are highly shock absorbing and provide quiet operation, while dampening vibration. Cushion rubber treads are vulcanized to cast iron cores. The soft rubber tread affords a cushion effect to the load. 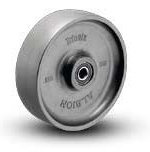 These wheels are highly shock absorbing and provide quiet operation, while dampening vibration. Full Pneumatic (SF) Recommended for the greatest possible protection to both loads and floors. If you transport fragile materials or parts, or if you move delicate instruments over rough floors, you should consider a pneumatic tire. Full pneumatics cushion the load on air, just like an automobile. They must be properly inflated as indicated in wheel table. Can be filled with urethane foam to make them deflation proof, but foam has no effect on capacity. Suitable for extended service. Never-Flat (NF) Recommended for the greatest possible protection to both loads and floors. Perfect replacement tire for pneumatic or semi-pneumatic applications. This solid urethane tire has similar rollability characteristics as a pneumatic tire... but they never go flat. Replacement parts available. 8" Grey wheel. 10" Black wheel. The EPA registered and FDA compliant antimicrobial additive used in Prevenz™ wheels is designed to suppress the growth of a variety of destructive and odor causing microbes including bacteria, molds, mildew and fungi. 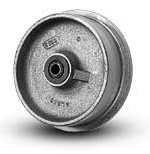 These wheels are suitable for a variety of applications including medical equipment, food equipment, pharmaceutical, chemical, meat & poultry, processing plants and more. To order add “PREV” to end of caster number.